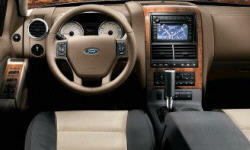 See TSBs and recalls for the 2008 Ford Explorer. Chart based on 57 repair trips. The repair cost chart excludes repairs made under warranty, do-it-yourself repairs, and repair trips that include maintenance. US $227 Vanity mirror hinged covers on both sun visors broke which caused the vanity mirror lights to stay on. US $397 Dealer notified us during maintenance visit that tie rod ends needed to be repaired. They replaced both but only one was worn because the boot was torn. US $320 Rear wheel bearing making a loud noise at highway speeds. 32000 mi broken hinge on drivers side vanity mirror. 122000 mi Interior lights never fixed. US $120 Passenger was blowing cold air instead of heat. Blender actuator on that side was replaced in 30 minutes. 34000 mi The rims on the car were corroding. 4 new rims and sensor bands were ordered and installed on the next visit. US $150 Moaning from front end, both front wheel bearings needed to be replaced. 48000 mi Front Driver axle seal was leaking. The dealer replaced the seal. 35000 mi Ignition switch had to be replaced. Vehicle has automatic seat reverse when key turned off. This started happening when going over a bump in the road. very dangerous. Ignition switch had to be replaced. Vehicle has automatic seat reverse when key turned off. This started happening when going over a bump in the road. very dangerous. US $159 Leaking front axle seal. Replaced seal at local transmission shop. Topped off fluid. US $99 found front cover leaking, remove cover, reseal with RTV and re-check for leak and refill differential. US $300 Transmission Flush, filter replacement, and oil change. US $550 Radio did not switch off when keys were removed from the ignition thus discharging the battery. 13000 mi Water leak in rear of truck, repair crack in body seam. Water leak behind third brake light, replace third brake light. US $620 Both Front Wheel Bearing Hubs replaced. 17050 mi Driver side power running board faulty, would not retract. Error message on display saying "Driver door ajar". Door switch replaced under warranty. 32240 mi Power Runnung board stopped working when door opened and closed. 58560 mi Front wheel bearing noise, due to premature wear. 65000 mi Issue with Sirius working within steering wheel (had been checked 2x previously malice finally ordered a new part and repaired the problem. No further issues. US $100 The front differential began to make noise. A bad bearing from the factory that just showed up. There was grease in the pumpkin. Grease changed, additives added, noise the same. Ultimately will have to change out the bearing or swap out end. US $75 Replace trans filter, change oil transfer case and trans.Repair made difficult by Fords none transmission filler on this model. it is very heard to get the fluid in correctly, the special adapter costs $20 at Advanced Auto. What a pain!!!!!! US $180 Replace four rotors, all brakes, and two calipers. US $59 Blend door repair. would have been nice if Advanced Auto sold me the right part. The right part number even though I have heat and air to the 3rd row is Dorman 604-209. Don't let then sell you Dorman 604-213 it won't work...there is only one blend door which at the base of the drivers side dash. 60000 mi Left front bearing was noisy. Replaced by dealer under 30 day guarantee. U Joint was noisy as well. Rear park assist sensors were intermittent. Dealer replaced wiring harness. Parts ordered during earlier repair trip. See our lemon odds and nada odds page to see vehicles with no repairs or vehicles with more than three repairs. 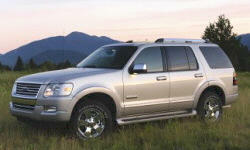 To see how frequently 2008 Ford Explorer problems occur, check out our car reliability stats.